I began the year in the middle of Sumothay, a larger mini for me (54mm... I haven't yet tried an even larger 75mm piece!). This was a really fun piece to work on and, looking back at my display shelves, I think he's one of my favorite pieces that I've painted. 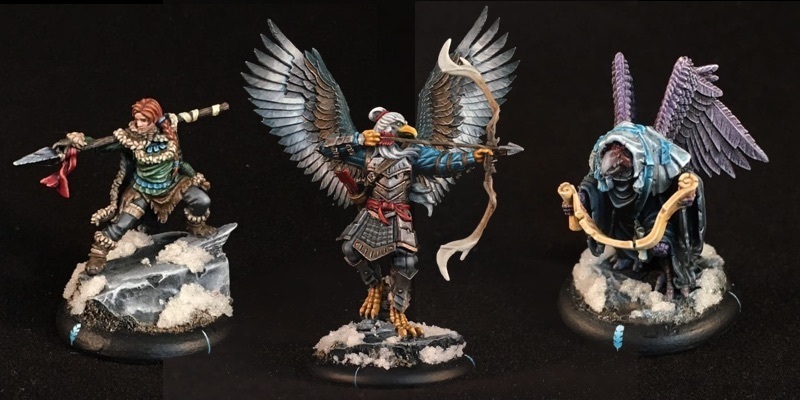 The end of 2015 saw me picking up my second Bushido army, the Tengu. So early 2016 also had me working on finishing out my warband with Nuniq, Buzenbo and Sanjakubo. Buzenbo is majestic as hell, but the little details on Sanjakubo are fantastic and I love Nuniq's pose up on her rocky ledge, spear slung casually, yet threateningly, over her shoulder. Painting these three was fun, but so was taking them to the table. 2016 also saw my first Bushido tournament and my feathered friends here led me to take second place. 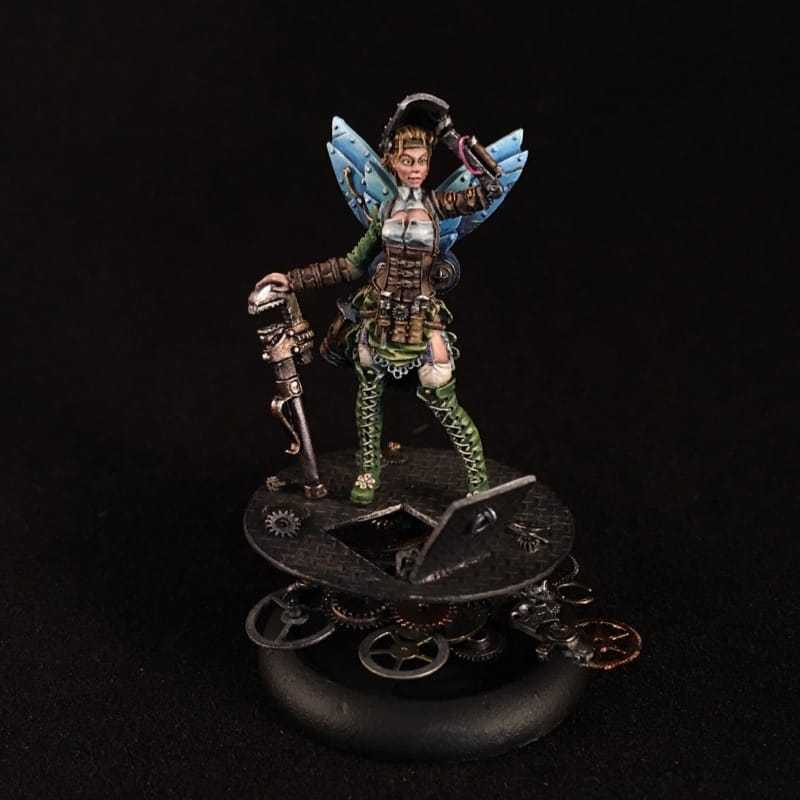 After working on the Tengu, it was time to swing the pendulum back and work on another display piece, Tinker Belle. Tink had been sitting in my "to paint" drawer for far too long and it felt great to finally get her up on a cork and start putting paint to model. 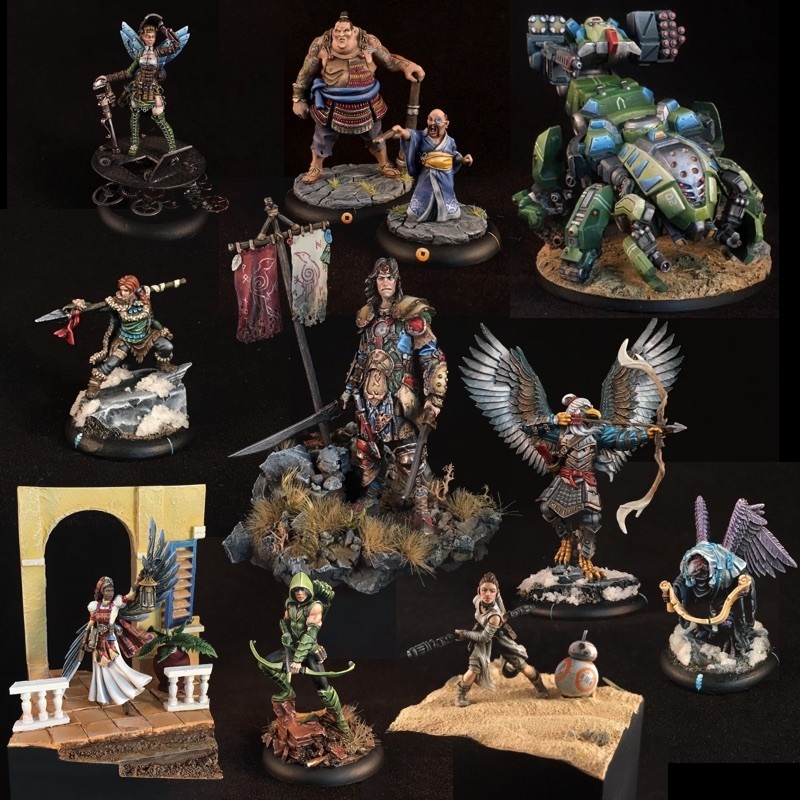 I'd painted a few other Guild of Harmony models, and they're all resplendent with fabulous little details. They really are the most intricate models I've painted and Tink was no exception. My next piece was a model that I'd been anxious to paint ever since I saw the first digital renders: the Maghariba Guard for my Infinity Haqqislam force. As soon as I was able to put it on pre-order, I did. It arrived in time to hit my painting station just after Tink. 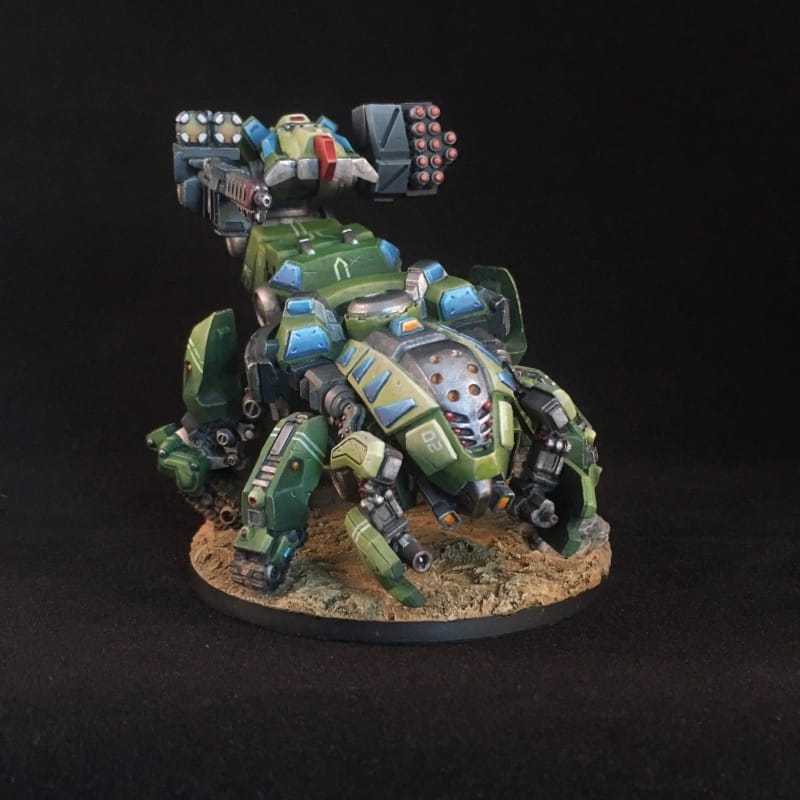 If it had arrived a little bit later in the year, it would have been a great candidate for my new airbrush. As it was, however, Maggie was a lot of brushwork! Another gaming model, Maggie also saw a lot of good gaming time. I hadn't picked up a new piece for my Haqq army in a while, so the Maghariba Guard breathed a bit of new life into Infinity for me. After painting all of that armor plating on the Maghariba Guard, it was time to paint some cloth. In this case, some madras cloth. Ever since I received Florence Nightingale, I'd been thinking of doing something a bit different with her. Taking her to a (steampunk) caribbean setting was in order. 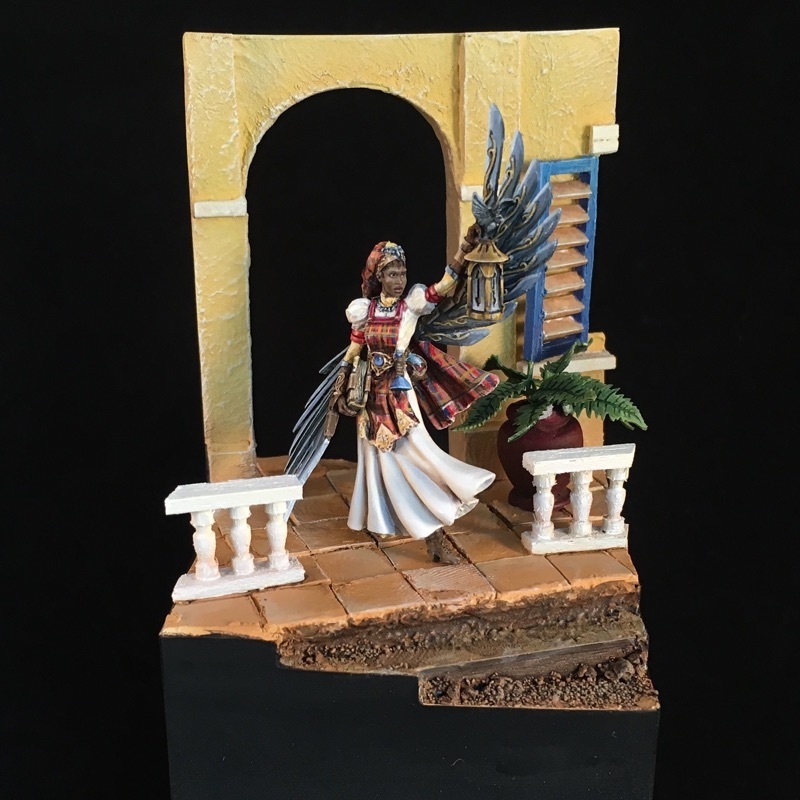 This meant doing a bit of construction work, so my big takeaway from this model was learning how to put together a bigger backdrop using plasticard, spackle, wood and other items. Ultimately, this piece came out just as I'd been picturing it. So, the pendulum kept swinging from display piece to gaming model and so it was time for another gaming model... or 2. 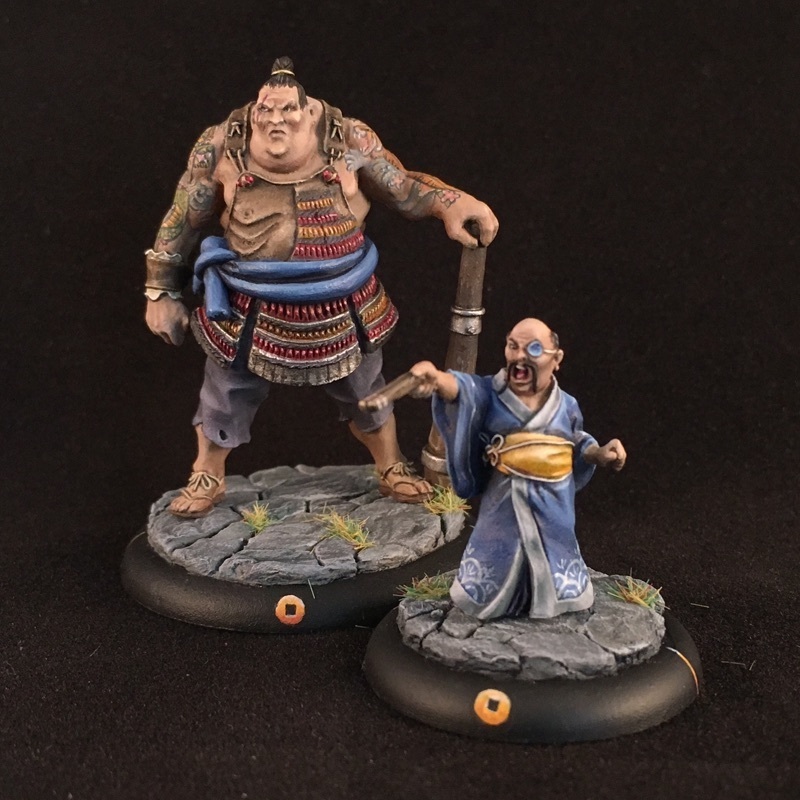 Oda and Tautola were the next to be painted, to join my Bushido Silvermoon Syndicate. 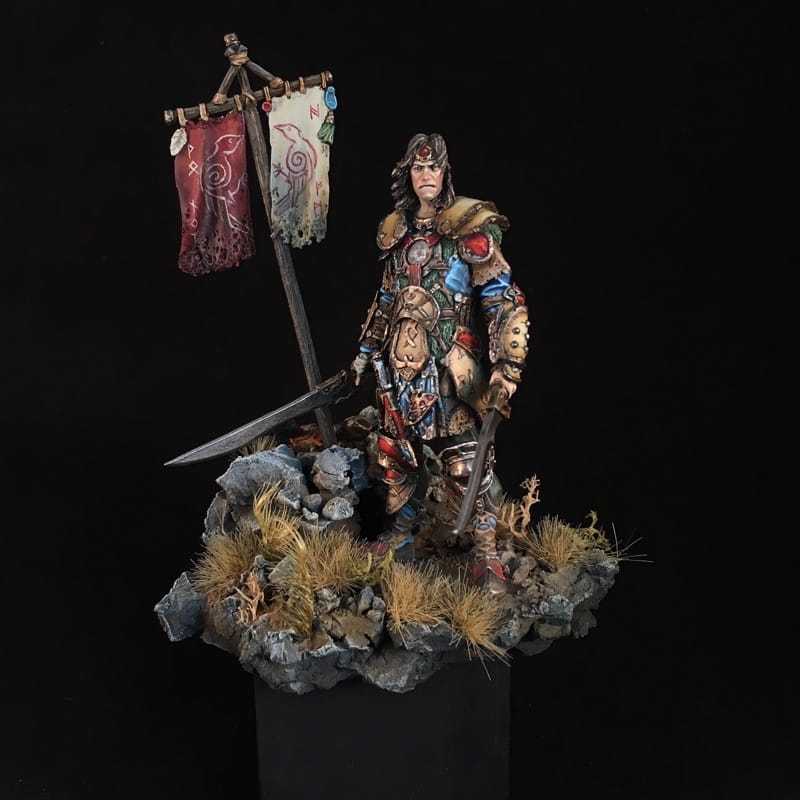 As with many of the Bushido models, these two again are full of character. Oda joined my other "old men" and Tautola provided another opportunity to practice my freehands with his extensive tattoos. Around this time, my birthday hit, bringing with it a fun new toy: an airbrush. The first model to receive the airbrush treatment was the Green Arrow. At one point, I'd looked at starting the Batman Miniatures Game, so the Green Arrow was my first purchase. However, soon after Knight Models started not one, but two new superhero games (Spiderman and Marvel) and I began to wonder if their priorities and attention were truly going to stick with Batman... 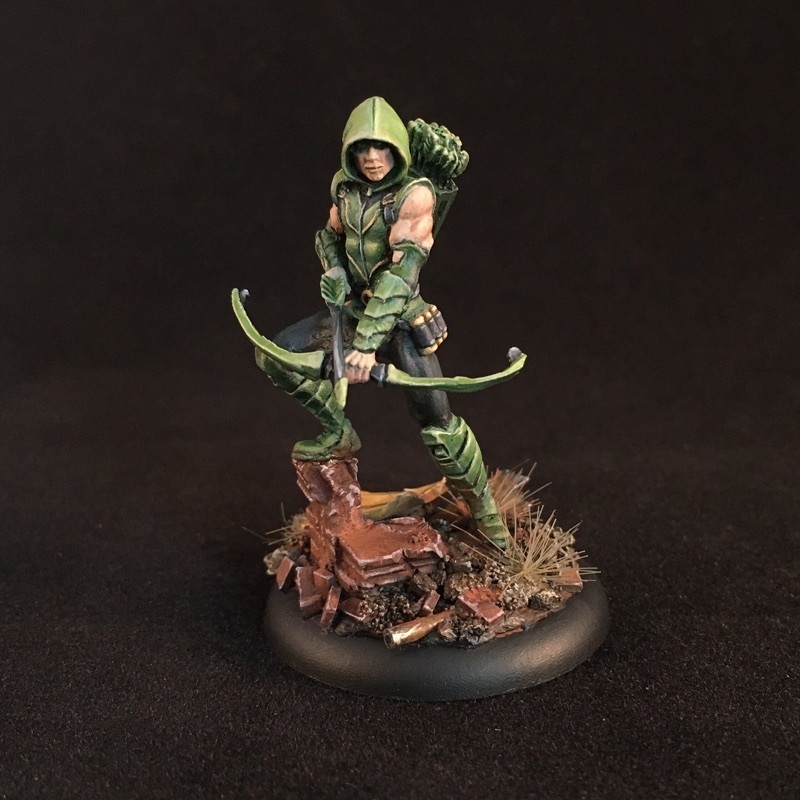 So, while I never wound up getting any more than the Green Arrow, I was still happy to paint him up. Sticking with named characters, my next piece was something I'd been eyeing since I saw the sculpt in-progress on Facebook. It took a little bit of conversion, but I thoroughly enjoyed putting together Rey and BB-8. I'm not a Star Wars fanatic, but like any self-respecting geek, I enjoy spending a little time in a galaxy far, far away and had fun watching the Force Awakens. 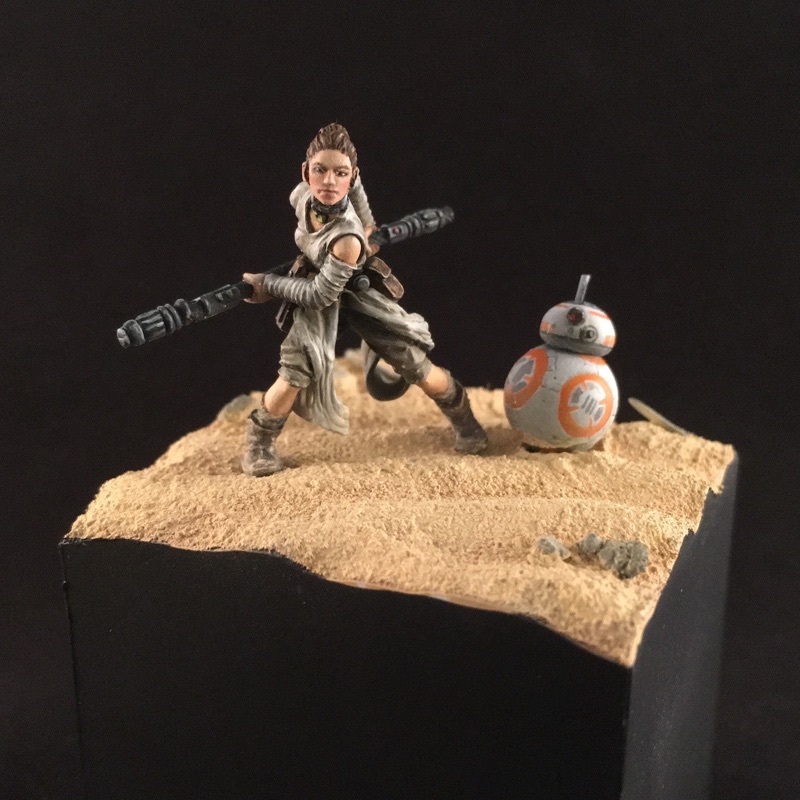 And, as a father to two girls, I loved seeing Rey in the lead knew I had to translate that to miniature form. While she doesn't quite make the list for 2016, my final piece is Amaryn. 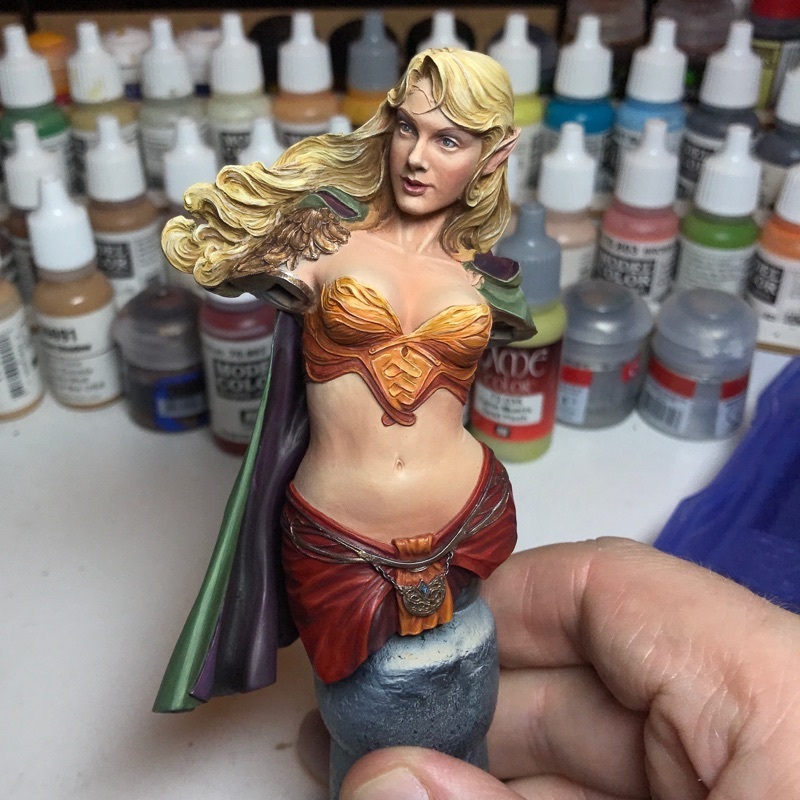 One of my resolutions from last year was to paint a bust and, despite not completing her, I'm going to call this resolution fulfilled as I did start her in 2016... real life and the craziness of November and December conspiring to slow down my progress. Oh well, she'll have the honor of being the first up on my 2017 year in review! Beyond the models themselves, one of my goals was to blog more this year. I can't exactly say that I was successful in that and didn't blog as much as I wanted to... not quite hitting a post per month. I did, however, join Instagram and tried to post a few more in-progress images up there and on Twitter. The immediacy of social media is great and I'll keep on trying to engage even further in 2017.